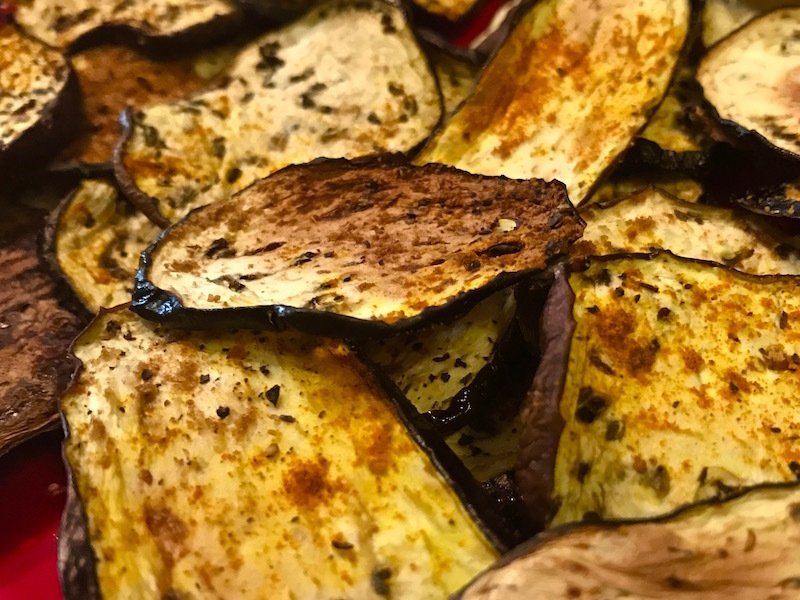 Crispy Eggplant Chips | Keep It Up, David! 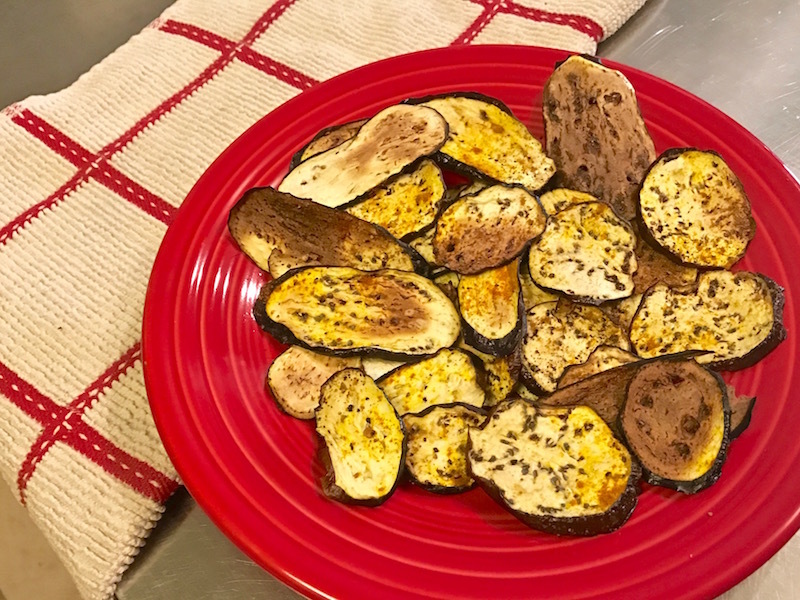 Here’s an easy, healthy snack for when you’re craving potato chips but don’t want all the carbs: eggplant chips! 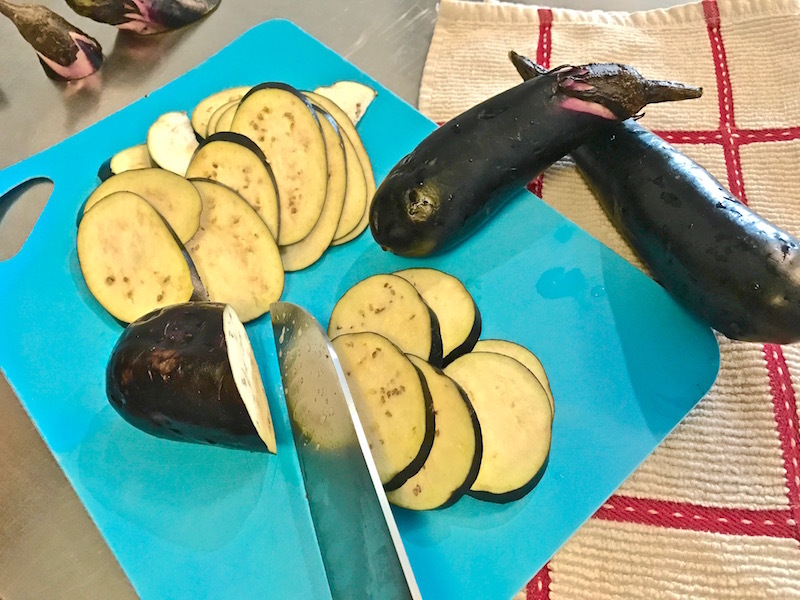 All you need are Japanese eggplants, and a few things you probably already have in your cupboard. 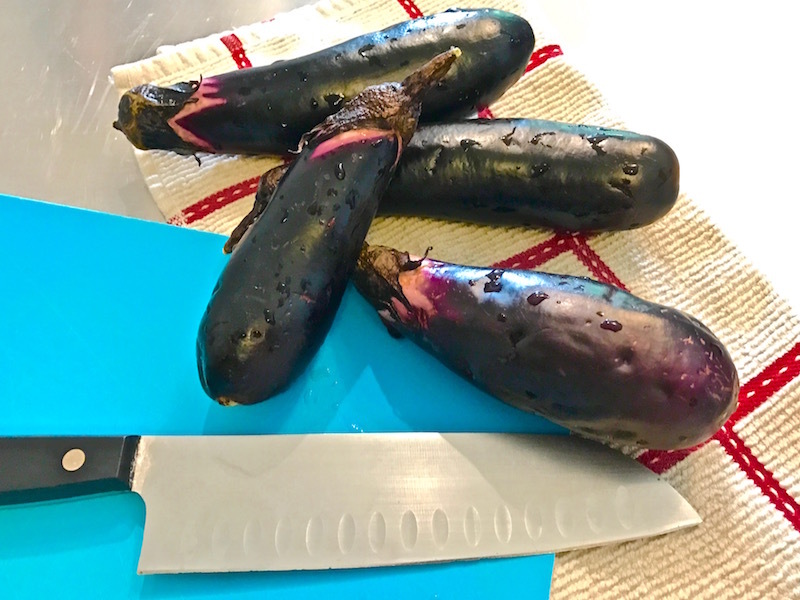 Slice your Japanese eggplants into thin slices. I cup them diagonally, which makes them a little prettier. What’s most important is that your slices are an even thickness, so they cook at the same rate. If you have a mandolin, use it! RELATED CONTENT: Check Out Other Healthy Veggie Snacks, Like Microwaved Kale Chips, and Parmesan Zucchini Chips! Spread the slices on a baking sheet. 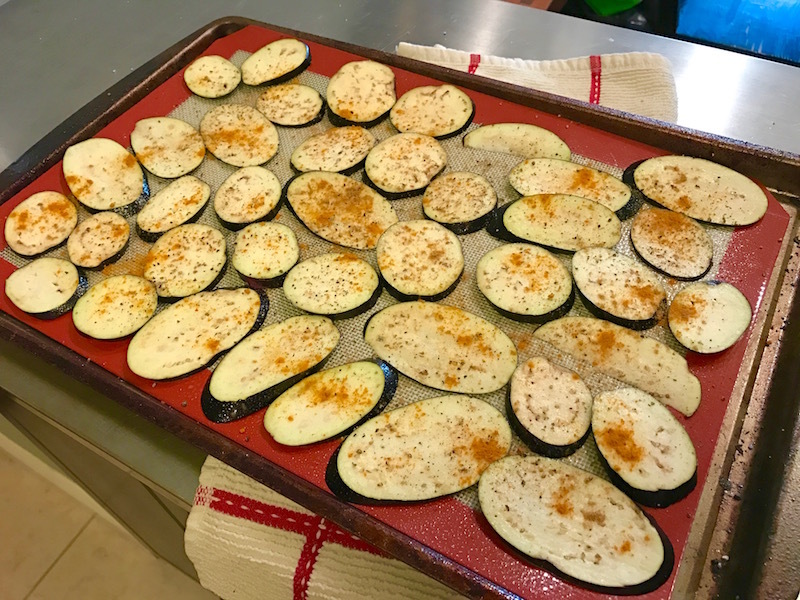 I used a 13″x 18″ sheet and found that the slices from about two and a half eggplant fit. I used a non-stick silicon sheet, but if you don’t have one, be sure to oil your sheet so they don’t stick. There, you’re finished with your prep work! Pop them in the oven for 20-25 minutes, until they’re crispy and dried out. They really are crispy, and you’ll be thankful you sprinkled with the salt and spices, because on their own, they’re a little on the bland side. (It’s eggplant, after all.) Another way to amp up the flavor is with a dip. 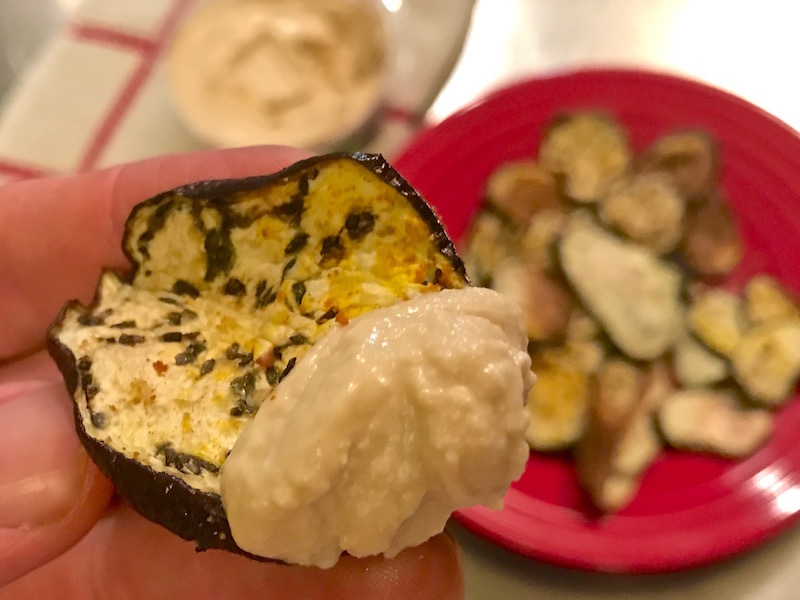 I ate my eggplant chips with garlic-flavored hummus, and they’d be good with salsa or guacamole, too. For dozens of healthy recipe ideas, check out my Recipes page! This entry was posted on Tuesday, October 11th, 2016 at 11:42 am and is filed under Uncategorized. You can follow any responses to this entry through the RSS 2.0 feed. You can leave a response, or trackback from your own site. I have never tried eggplant like this! I will be making these this weekend! I hope you enjoy, Amy! David – you keep me inspired! Lemon is a great idea – thanks!